Top 3 clothesline spaces you never knew you had! February already! Let’s look at saving some cash for 2018. Everyday households are impacted by increasing power costs. An instant way to save money and lower your household’s carbon footprint is to minimise the usage of one of the most power hungry appliances in your home- the clothes dryer. OK, so simply hang out your clothes more often, or is it just that simple? Stylish form meets function coupled with lasting durability is the mantra to a great clothesline. However, options have been limited in the clothesline sector. Cumbersome and restrictive sizing has meant hiding away this mundane amenity. 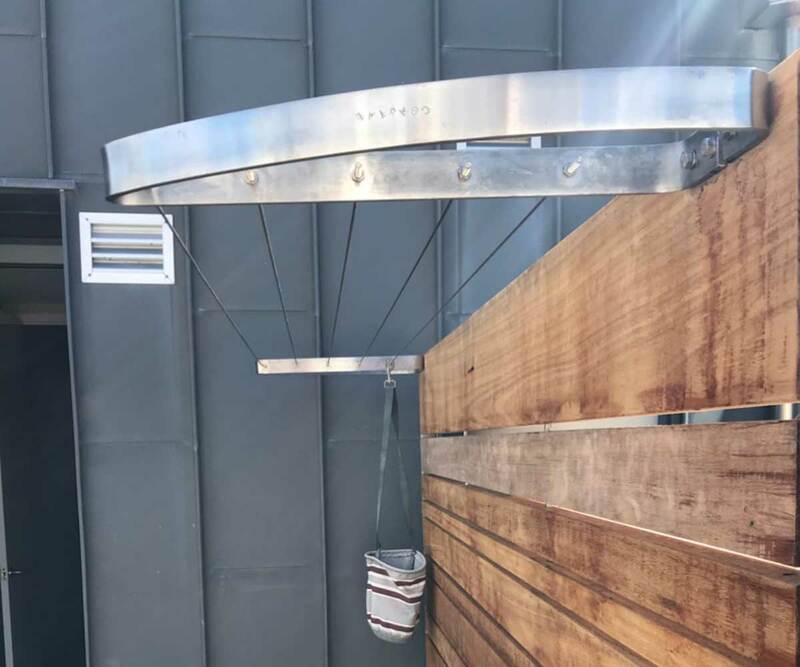 The key is to search for features including folding, customisation lengths, frame-less kits and stainless steel fabrication to deliver the most durable outdoor and versatile clotheslines. Engage some creative thinking and mount not just one but enough clever clotheslines to capture your home’s ultimate drying zones. Always look at your home’s most ideal zones and harness what nature has to offer. Here in Australia we try to install clotheslines on the northern side of the home, capturing the longest, sunniest aspects. Other ‘forgotten’ zones, often over-looked due to limited clothesline configurations, can become smart thinking alternatives for clothes drying. During the winter season a western wall or posts can be a fab spot for a clothesline. Under an eave is always great during the unpredictable and wetter times of the year. Spring often brings windy conditions down side passages for narrow clothesline alternatives. A must-have is quality in manufacturing because you are, almost daily, in need of a product you can trust. Buying sub-standard plastic and aluminium tubing clotheslines only hurt your pocket inevitably impacting the environment with landfill and over-production. So lower your environmental footprint with savvy purchasing. Use smarter clotheslines and think outside the square for mounting zones so you can stay away from overuse of the clothes dryer. Check out our range of Coastal Clotheslines and look beyond the average options to really invest in your household’s future. A win-win for your bank balance and the environment! We enjoy a chat in our market stalls so pop in! Weather permitting we attend Bruswick Heads Market (1st Sat month), Byron Market (1st Sunday month) and Bangalow Village Market (4th Sunday month). Our installation service is available in Byron Bay, the Northern Rivers of New South Wales and Tweed Coast, Gold Coast, Queensland. Thanks to our new customers in Huskinsson, Vincentia, Balgowlah Heights, Bellevue Hill and Alexandria. Enjoy your Australian owned Australian handmade patented clothesline and #loveitforlife. Check out our Instagram or Facebook pages, we like to stay social!